Quality ingredients give this smoky, sweet, and acidic sauce a leg up on the competition. Cowboy is one of the brands most synonymous with lump charcoal, and for good reason—it got its start over 100 years ago when Jess Rollins went from farm to farm and burned cleared trees into charcoal in Southern Ohio. From there, charcoal production was centralized to kilns in the 1930's by then owner, Roland Crace. The business then stayed in the Crace family, but the names and products shifted over time from Pioneer Charcoal in the 1950's to Hickory Specialties in the 1970's, who manufacturing liquid smoke and briquettes. 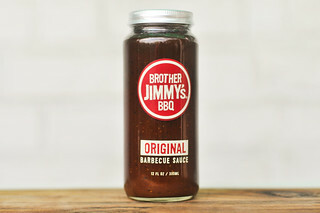 In 1992, Bob Evans Farms bought the line-up of Hickory Specialties, which led Don Jr. and Sam Crace to create a new brand, Cowboy Charcoal, that focused on making lump charcoal out of a plant in Albany, KY. Today, Cowboy is a subsidiary of Duraflame, and beyond the charcoal they're primarily known for, they also market wood chips and chunks, as well as three varieties of barbecue sauce. 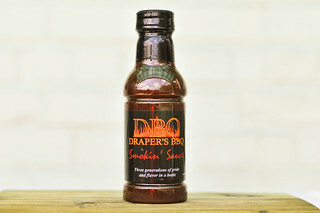 An intense mixture of molasses and smoke fills the nose on the initial smell of this sauce. The smoke is very dominant, but doesn't mask the heavy, acidic tomato base that gives the sauce a little fruitiness. There's distinctly vinegar mixing in too, adding to the tanginess of the sauce, which balances out the sweet molasses to a point. There isn't any heat present in the aroma, but some earthiness hints that there is chili powder at play. This dark maroon sauce has a semi-glossy sheen and a slight texture to it. It's also opaque, which makes it hard to see any spice specs at all. It has a consistency that straddles the middle of the thickness scale, and the sauce falls first in one large drop from a suspended spoon, followed by a number of quick, smaller drips. The last few drips release slowly, and when the sauce ceases falling, there's a medium coating left clinging to the silverware. After an initial syrupy sweet start, an equal mixture of strong molasses and acidic tomato create the start of the barbecue profile. Next, smoke works its way in while the sauce's balance tips from more sweet to tangy. Then undertones of garlic and earthy pepper come out right before the smokiness turns up a notch and becomes a bit acrid. The vinegar and heavy tomato persist, creating a tangy and smoky aftertaste with a deep tomato flavor. The sauce coated the chicken in a medium, uneven layer that baked down well over indirect heat. When moved to direct heat, there was some light caramelization mixed with some minimal burn off. 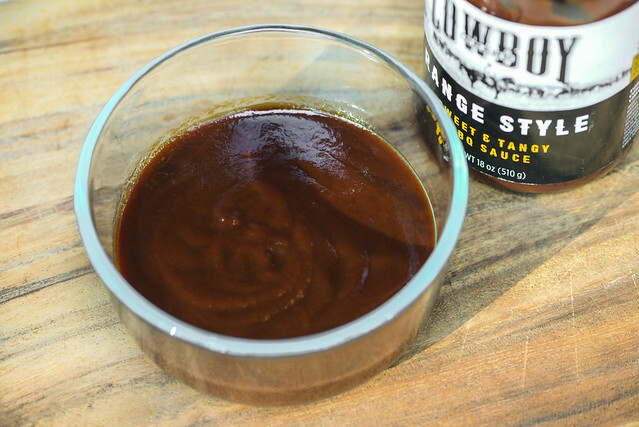 The sweetness of the sauce ramped up after being cooked, making the once super acidic tomato have a more ketchup-like flavor while maintaining the strong molasses and smokiness to create an overall robust barbecue flavor. The increased sugar meant the sauce also wasn't as tangy and some of the more nuanced spices that were in play out of the jar became drowned out. The last Cowboy sauce I tried, Prairie Fire, had an nice balance of sweetness, tang, and heat that made it clock in well above average in my mind. Range Style left me longing for that better mixture of flavors though with its profile that felt just slightly too acidic out of the jar, and then a bit too sweet once cooked, and in both cases, a smokiness that straddled the line of acridness. That being said, it tasted like a sauce made of quality ingredients and worthy of being chosen over the average supermarket sauce, where my qualms with this sauce seem minuscule compared to the common tendency to take boldness to extreme levels. 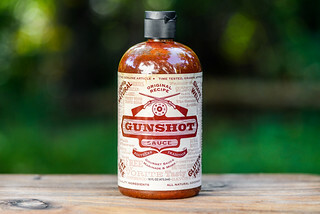 So I wouldn't hesitate to pick up a bottle of Range Style and slather it on some ribs or chicken, but if you're fan of a little heat to balance out sweetness, like myself, Prairie Fire might be more your speed. 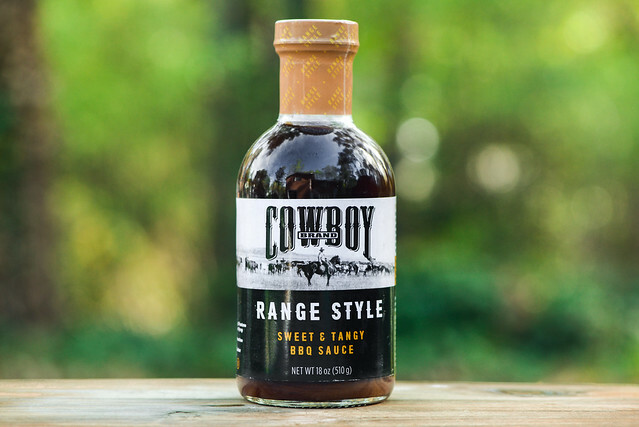 While I tend to ask folks to send me a couple bottles of sauce—one for review, one for giveaway—Cowboy Charcoal outdid all others by sending even more sauce to increase you chances of winning a bottle for yourself. 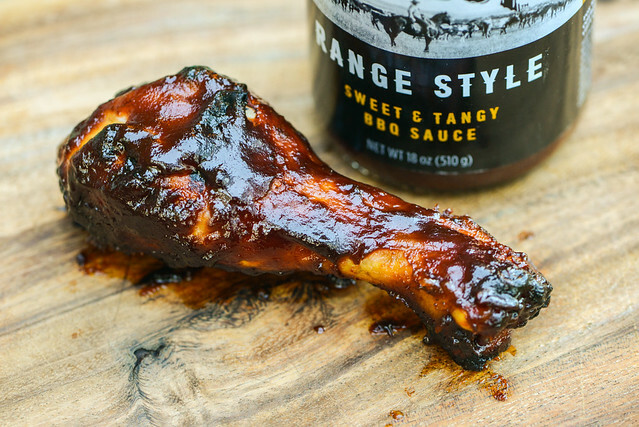 So this week we'll be giving away two bottles of Range Style, and all you have to do to enter is to comment on this post with what's on your Labor Day menu (grilled, barbecue, or other) Deadline for entries is 11:59pm on Tuesday August 29, 2017. Read the official rules for more details. One entry only per individual. Good luck! Ribs, Chicken, grilled Corn on the cob and Jalapeno Poppers! I'm planning to make pulled pork on my smokey mountain. BBQ Chicken and all the fixin's! Making my famous pork baby back ribs & chicken thighs. Fresh bratwurst stuffed with sauerkraut wrapped in bacon. we'll be celebrating w/friends and family at my best friends home in Michigan. She just bought a new grill, I'm making beef kabobs w/a variety of veggies from the local farm stand. Backyard BBQ with family Ribs and chicken. Hoping hubby will cook up some smoked ribs and chicken!! And I always love a smoked burger!! We are having ribs, salad, corn on the cob, baked beans, and raspberry surprise. Backyard BBQ with family Steaks,Potatoes and Corn! we always do steaks and bbq chicken! can't wait! I think I'll finally try to slow cook some pork belly. We go for the grill! We make carne asada! I think we're gonna grill ribs and corn on the cob.